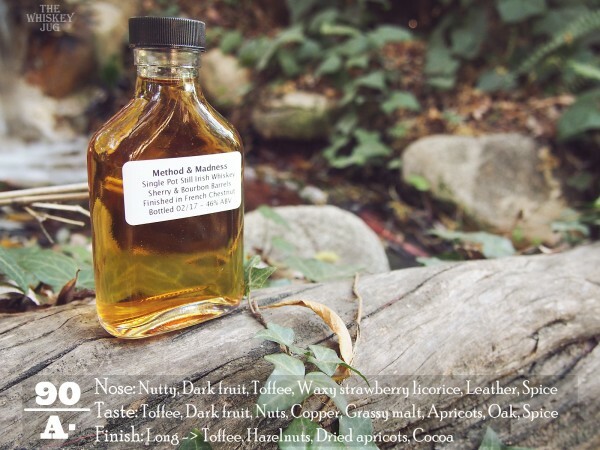 When I first read about the Jameson Method and Madness series I was enthralled with the idea and instantly wanted to know more and try them all and thanks to an amazing SCWC member I got to try the Method and Madness Single Pot Still. Unfortunately, the rest might not get reviewed because they proved to be both expensive and hard to find. So… yeah. Anyways, we have a nice sized sample of this one to dig into, which we’ll do in the Method and Madness Single Pot Still review below, so I don’t have too much to complain about. We’ll go over all of the details of this particular release below, but the gist of it is that it’s a standard Jameson Single Pot Still that went through a non-standard wood process. Intrigued? Keep reading. Nutty, dark fruit, toffee, waxy strawberry licorice, leather, spice, grassy malt, copper and a bit of vanilla frosting. Toffee, dark fruit, nuts, copper, grassy malt, apricots and a bit of oak and spice. Long -> Toffee, hazelnuts, dried apricots and cocoa. Great balance, round full body and a light syrupy feel. 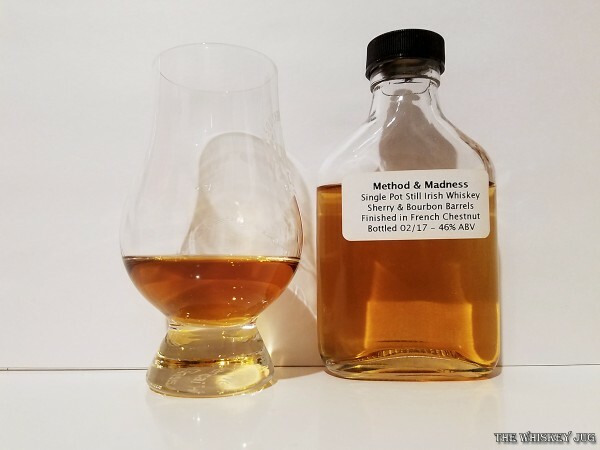 Method and Madness Single Pot Still is a solid complex nutty malt filled with layers of dark sweet flavors and aromas. The aroma, in particular, is nutty malty, oily, rich and aromatic in all the right ways. The palate is rich, dark and sweet with a coppery malty backbone that gives this whiskey a great structure. This is one of those whiskeys that, as I’m sitting here enjoying a glass, I’m having a hard time finding fault in it. I’m having a hard time seeing where they could have done more. It’s done well, I’m enjoying it, I’d love to drink it regularly and while it’s not on the level of richness of an A level whiskey it’s defintely on that “damn that’s good” level. If you get the opportunity to try the Method and Madness Single Pot Still do it! Big thanks to Caroline for the sample! Method and Madness Single Pot Still is good, really damn good and I’d recommend it to anyone. 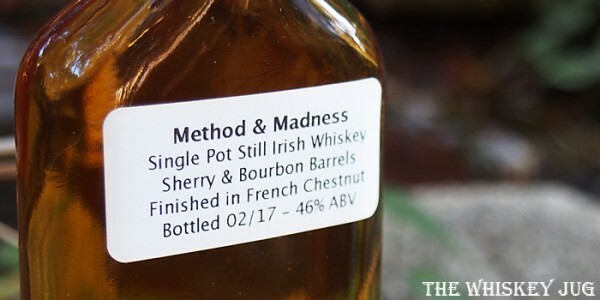 The post Method and Madness Single Pot Still Review appeared first on The Whiskey Jug.